A Consistent Performer stock means stock which gives consistent returns every year irrespective of market conditions. These type of stocks are an ideal choice for long-term and medium-term investors. There are two main advantages of investing in consistent performer stocks. You must be aware that after the introduction of LTCG, you need to pay LTCG@10% if long-term capital gains are above 1 Lakh in a financial year. This means you have to be careful in selecting a stock, as selling of stock after one year also cost you money. The only option you have is to maximize gain and invest in stocks which are consistent performers. Investing in such stock help you to avoid unnecessary churning of portfolio. However, it is a difficult task is to identify consistent performer stocks for the investment. You need to collect a lot of information and do a research in order to find the best stock of a reputable company with good business potential. You may or may not get success in identifying best stock for the investment. Don’t worry I have something special for you. Today I will be sharing details about 7 stocks that consistently beating the market and generating positive return since past three years. Avanti Feed is consistent performer stock since past three financial years. Avanti feed is in the business of animal feed, frozen shrimps, processed food, and meat. It is debt free company with very good fundamentals. Last year (2017-18) Avanti Feed has generated 180% CAGR return for the investor. In 2016-17 Avanti Feed generated 102% return. 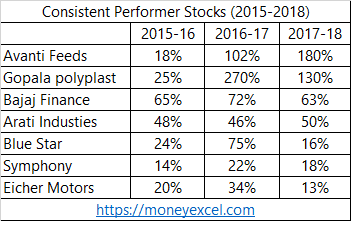 Gopala Polyplast is next consistent performer stock. Gopala Polyplast is in woven fabric and laminated bag business. It is a small-cap company with strong client base. Last year (2017-18) Gopala Polyplast has given 130% return to the investor. The performance detail of this stock is given below. Bajaj Finance is leading finance company backed by reputed Bajaj Group. Looking at upcoming Infrastructure projects in India, finance companies like Bajaj Finance has very good future. If we see the historical performance this stock has given very good track record of posting higher profit and revenues. 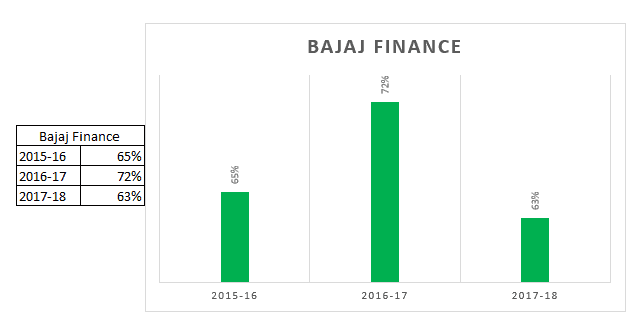 Last year despite of unfavorable market condition Bajaj Finance has given 63% return to the investors. Aarti Industries Limited is dealing in chemical and pharmaceutical business. The company has good consistent profit growth of 28.90% over 5 years. Last year (2017-18) this stock could able to give 50% return to the investors. Blue Star is one of the largest air conditioning company in India. Net profit and sales of the company are growing YOY. The company has reduced debt. Last year (2017-18) this stock could able to give 16% return to the investors. Symphony is leading name in Air Cooler segment. Symphony is virtually debt free. It is good multibagger stock for the investment. Last year (2017-18) this stock could able to give 18% return to the investors. Eicher Motors is a well-known name in the auto sector. Eicher Motors stock is a multibagger stock. Eicher motors have maintained good consistent profit growth of 41.96% over last 5 years. It is one of the expensive stock of Indian stock market. Note – This return calculation is financial year wise (April to March). An investor may consider investing in these stocks for long-term perspective or may find own consistent performer stocks for the investment. Lastly, these stocks have performed consistently well that does not mean that they will continue to perform in the future. You should keep tracking the performance of the stock and make changes in your portfolio at least once in a year.